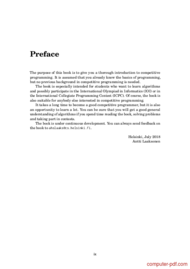 The purpose of this book is to give you a thorough introduction to competitive programming. It is assumed that you already know the basics of programming, but no previous background in competitive programming is needed. The book is especially intended for students who want to learn algorithms and possibly participate in the International Olympiad in Informatics (IOI) or in the International Collegiate Programming Contest (ICPC). Of course, the book is also suitable for anybody else interested in competitive programming. It takes a long time to become a good competitive programmer, but it is also an opportunity to learn a lot. You can be sure that you will get a good general understanding of algorithms if you spend time reading the book, solving problems and taking part in contests. Description : Download free course Competitive Programmer’s Handbook, pdf ebook on 296 pages by Antti Laaksonen. It is never too late to start learning and it would be a shame to miss an opportunity to learn a tutorial or course that can be so useful as Competitive Programmer’s Handbook especially when it is free! You do not have to register for expensive classes and travel from one part of town to another to take classes. All you need to do is download the course and open the PDF file. This specific program is classified in the Computer programming category where you can find some other similar courses. Thanks to people (like you?) Who share their knowledge, you can discover the extent of our being selected to easily learn without spending a fortune! Competitive Programmer’s Handbook. is available for free by its author. But also many other tutorials are accessible just as easily! The latest news and especially the best tutorials on your favorite topics, that is why Computer PDF is number 1 for courses and tutorials for download in pdf files - Competitive Programmer’s Handbook. and Computer programming! 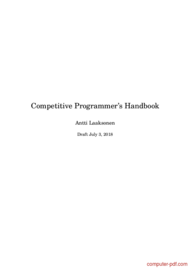 Download other tutorials for advice on Competitive Programmer’s Handbook. you will see! We will do everything to help you! And you dear surfers what you need? The best course and tutorial, and how to learn and use Competitive Programmer’s Handbook. of course!